I like surprises, not the kind that make you pee in your pants, and seek therapy and tubs of Haagen Dazs, but the sort that delight you for the sheer level of their consideration and thoughtfulness. 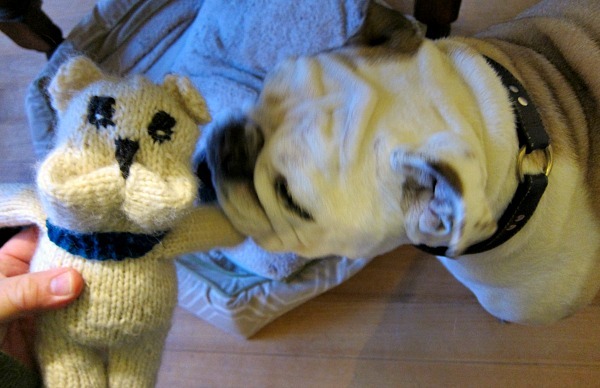 I was the recipient of such a fine surprise this week in the form of a knitted bulldog, a wooly little doppelganger of my buddy Boz. My friend Jill, fiber master, philosopher, and keeper of the geese, dropped off a piece of her handiwork that exceeded any measurement realized on the cuteness scale. Boz loved his mini-me so much, he wanted to eat it up. I explained to Boz, such devotion is not prudent, or else we’d finish the day with a Vet visit and a dismembered alter ego. 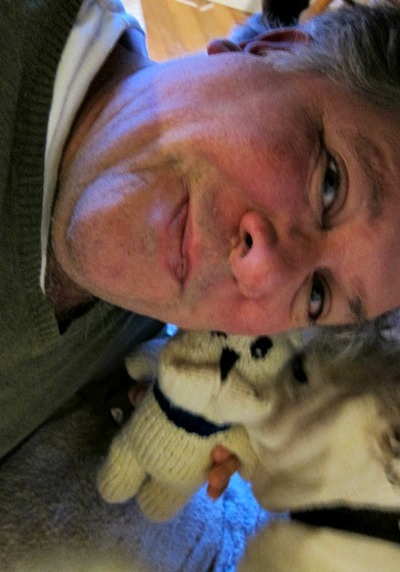 Selfie quality goes down when holding onto a knitted bulldog, while holding off a real bulldog, all while under the kitchen table. Knitting is like an unsolvable mathematical equation to me. I fear if I tried it for any length of time, my head would explode like a stomped-on pack of ketchup. My brain is not wired for such precision, hand-and-eye coordination and focus. The first shiny thing to pass my way, and the knitting needles would be dropped or repurposed as satay skewers. A quick howdy-do and back on the table for mini-Boz. Vashon Island, big on fiber arts, is home to some very talented weavers, knitters and felters, and Jill is among them. So thank you Jill, thank you for this little guy with a big heart. Just like Boz (who likes top-billing), he makes me smile. Oh how he makes me smile. Gracie is her own dog. Napping trumps revelry. As for Gracie, she refuses to mug for my camera when a sunny landing is to be had. Vashon Originals: This is Jill’s Etsy page. She’s also know for making aprons and dog coats out of old waterproof feed sacks (a very clever woman). Wildwood Woolery: My friend Lisa’s site, which shows you how far fiber arts can go. My feet are happy when I wear her socks; my neck is toasty warm when I’m wrapped in one of her wooly scarves. And needless to say, my dapper factor goes way up. Vashon Sheepdog Classic: This amazing event features some super smart dogs, superior fiber arts and of course, herds of weary sheep. That is THE most adorable thing I have ever seen—how very clever your friend is!! 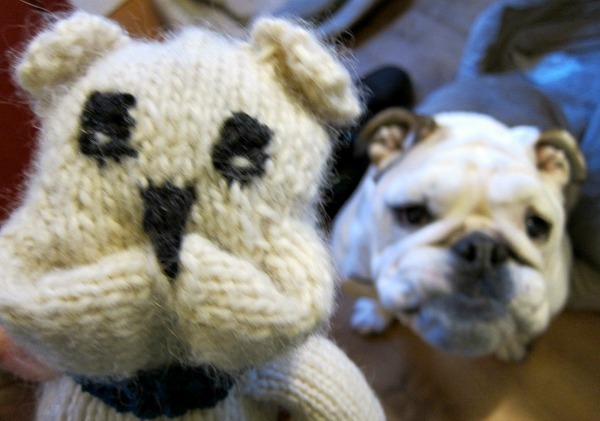 Are you certain Gracie’s not sulking lacking her own knitted doppelganger? SURELY you have enuf material for a photo book?! Adorable! 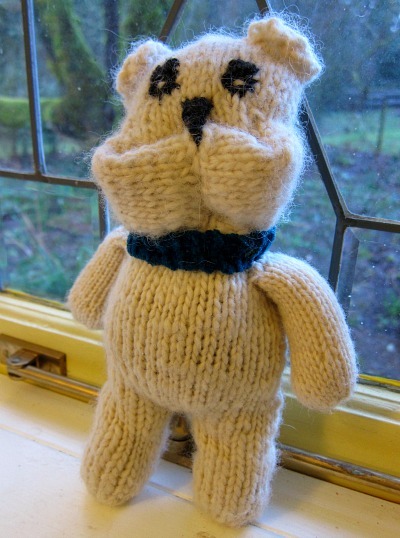 And the knitted version of our beloved bulldogs would not eat an entire chocolate orange, as my Pipi did (again), necessitating that dreaded and undesired visit to the vet. 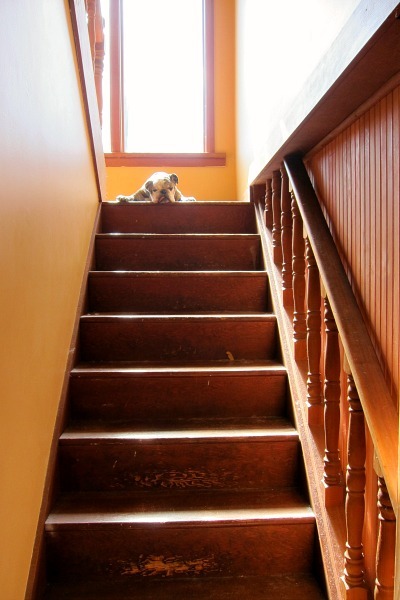 That is super cute, Gracie at the top of the stairs sun bathing even cuter. You know I love that. Too cute! Speaking as a knitter I can safely say if you manage to dress yourself & tie your shoes you can knit. Its rhythmic. It allows the knitter to touch beautiful soft color & then wrap it around those we love. It allows the knitter to decide.what level of perfection is sufficient for the day. This probably changes over time as the knitter improves at their skill. Its addictive legal & non fattening. A danish friend.told.me.that knitting was a required class for first.graders. they had to knit socks.I’ve read your blogs. You are way past first grade. You can do it. Then you can do it with friends. Such fun! My nephew knits. He taught the guys on his ambulance team to knit. My brother spins. He couldn’t help himself. He had to show his wife how to do it right ie: his way. Come to the dark side.